This is Part 2 of our Introduction to Lean Manufacturing Principles Series. 5S is all about the productivity implications of organization. A place for everything and everything in its place really matters if done with an eye towards manufacturing productivity. We’ll delve more into the exact meaning of these words in the 5S methodology shortly, but for now, consider that they describe a process for organization the workplace in such a way that everything is Easy to Find, Easy to Use, and Easy to Put Away from a production perspective. That all sounds like a good idea, right? The decision making process used to arrive at the 5S organization for the shop involves a dialog with the staff that leads to a greater shared understanding of how they do their work, which is also a useful by-product. Let’s start by going over each of the 5 terms or phases to see how they’re implemented. 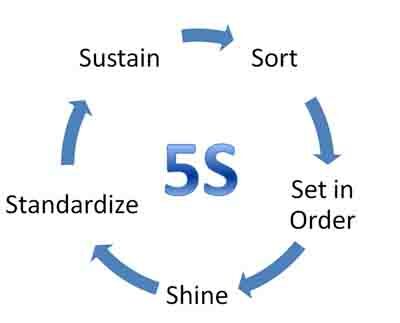 Sorting is a critical first step because it minimizes unnecessary later work to establish 5S. To “Sort” in the 5S methodology means to go through and remove any unnecessary items and dispose of them properly. Unnecessary items are a distraction when you’re trying to focus on a particular task and they can even turn into obstacles that block view or access to necessary items if there are enough of them. A shop that properly practices 5S will strive to avoid accumulating unnecessary items and will constantly be on the lookout for items that could be eliminated because they’re not necessary to the task at hand. Be careful not to go too far. In theory, one single Torx wrench of the correct size to change inserts might be enough if shared across a number of machines and operators. But that Torx wrench is necessary to the job at hand and it is far more convenient if each machine has its own wrench in a carefully organized and convenient location. OTOH, if there are wrench sizes that are never used, perhaps it makes sense to remove them. Setting things in order is a matter of arranging them to create a Visual Workplace. It should be possible to know the status of everything at a glance. Peg boards that have the outline of each tool in red paint tell you immediately which tools are missing or where to put away a tool when you’re finished with it. Set in Order is also concerned with making sure everything is in the most convenient location for production. It should be easy to access every tool needed with an economy of motion and as little wasted motion as possible. Often this means decentralizing commonly used tools and materials so they’re conveniently located with the machines where they’re needed. The usual tool for understanding where things need to be is called a “Spaghetti Diagram.” It’s just a simple schematic floor plan of your shop with lines drawn to show where the staff needs to move to do their jobs. You don’t need a fancy CAD diagram to pull it off. A big white board is often perfect for these exercises. Just the act of creating a Spaghetti Diagram will help you to learn a lot the weaknesses of your shop’s current organization. Think of it as a simplified time and motion study that requires no stopwatches. 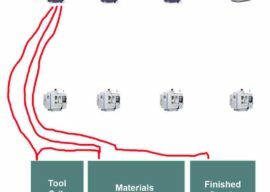 In this diagram, we can see the shop has arranged its CNC machines in neat rows, and there is space along the back wall for storage of tooling, materials, and finished goods. 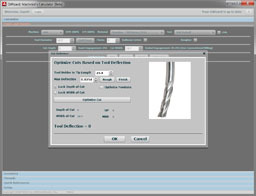 The lines depict the lathe operator’s motions as he goes to get tooling and materials and takes the finished parts back to their storage. This particular layout makes life easy for the mill operators (assuming the mill’s face the right direction! ), but the lathe operators have to go extra far to access the materials they need. Perhaps relocating the mills along the back wall and putting tool crib, materials, and finished goods in the middle would be a better arrangement. Or, perhaps making one trip in the morning and one in the evening with a laden cart would make this arrangement work better. Lots of ideas will present themselves once you start talking about how the work is done with the staff and asking for their ideas on how to Set things in order. 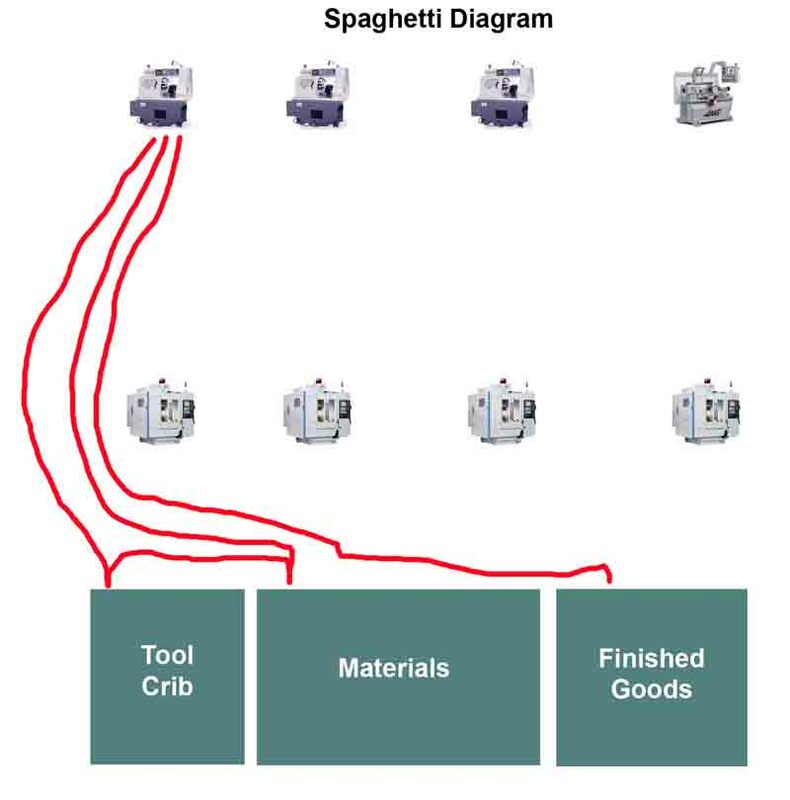 A Spaghetti Diagram should also be done for the immediate work area around each machine, and those areas should be standardized based on the tasks of that work cell. It isn’t just the big motions that benefit from optimizations, hundreds of small motions in the course of a day add up too. Organization like this doesn’t have to be expensive. Two layers of foam, with the one on the bottom being red, was all it took to organize the tools in the drawer. Pegboard and a bit of red paint and some stencils will organize tooling that hangs. 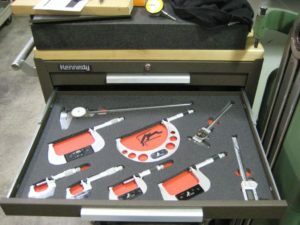 Tooling carts and racks with some labeling will do for your toolholders. Labels and signs are often an important part of the Set in Order stage, so make sure it’s easy for your shop to create professional labeling and signs easily. As an aside, one would think that smart phone health monitors that can tell you how many steps you’ve taken would make it easy for shops to measure the “before’ and “after” effects of 5S. If it’s done well, the staff should be taking fewer steps during the day to get things done. Shine is about two important concepts. First, it literally means to make your workplace shine. Clean everything thoroughly and on a daily basis. The second aspect of this stage is Inspection. While you’re cleaning, look for problems with the equipment–leaks, vibration, cracks, and anything that is not quite working as it should. Perform preventative maintenance. The key purpose of the Shine Stage is to keep everything in top condition so that when someone needs to use something, it is ready to be used. Cleaning a work area creates the opportunity to visually inspect equipment, tooling, materials and work conditions, and to make any repairs, changes, or upgrades before problems can interfere with production. The Standardize step is about documenting what’s needed for the other steps and making sure the entire staff understands what they need to do. A very common tool for making this happen is a Checklist. Consider creating Checklists for what needs to happen at the beginning and/or end of each day to implement your 5S procedures. 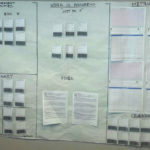 Make sure the Checklists are readily available in a durable format, such as a laminated sheet. 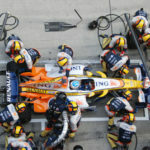 Most of all, make sure the staff are using the Checklists and implementing their contents. 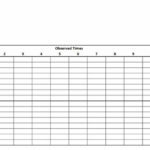 These Checklists and other documentation capture your shop’s Best Practices with respect to your 5S program, so they’re a very important and tangible way to manage the program and ensure it is up to date and always improving to be the best that it can be. Sustain is all about making sure the 5S program continues to function. It’s easy to make rapid progress when you first start a 5S initiative. If nothing else, 5S brings a very visual change to the appearance of the shop, as it should. But once everything is all organized and shiny clean, it’s also easy for the old habits to come back. Tools start being left out, perhaps just a few at first. Checklists are not followed. Pretty soon you’re back to nearly the situation you had before the 5S initiative began. Hence the importance of actively focusing on Sustaining the practice of 5S so that you maintain high levels of compliance. – Checklists: Get the staff comfortable using the checklists whether or not the think they have them committed to memory. – Signs, posters, and employee newsletter articles: Designed to keep 5S top of mind. – Team and management check-ins: Periodically bring up the 5S program, emphasize the need for compliance, and ask for feedback on how to improve it further. – Performance reviews: Make 5S compliance an obvious part of any performance review where workers are rated on their ability to produce 5S results. There’s an old saying that, “You get what you expect and inspect.” Make it very clear to the staff that you expect 5S and you will inspect the results to ensure that it is there. – Department tours: Think of them as informal snap inspections. Periodically get everyone together from the department and take a walk around tour looking to see how well 5S is being practiced. This makes it clear you’re serious about 5S and also gets the competitive juices flowing as you move from one area to the next and compare how well each area is meeting the 5S goals and standards. There’ve been a number of Lean Manufacturing surveys that suggest that 5S is the most widely adopted Lean principle and proponents of Lean often suggest a 5S initiative as a great way to get started with Lean Manufacturing. Certainly everyone loves to see the Shop Floor looking clean and well organized. But what are the tangible benefits an organization can expect to receive from a successful 5S initiative? – Higher equipment availability: Keeping everything clean, well-maintained, and well-organized leads to higher availability and less down time. The checklist system also provides a good basis to add further preventative maintenance programs down the road after the 5S initiative is in place and working. – Space savings: Once things are organized to minimize motion, it is often discovered that less space is needed. Getting rid of unnecessary supplies and machinery is another source of additional square footage. – Improved safety: Eliminating clutter and unnecessary items from the shop can’t help but make it a safer place to work. Keeping everything clean and well-maintained also contributes a safety dividend. – Lower defect rates. Eliminating distractions (such as from clutter) and reducing unnecessary motion leads to lower defect rates. – Reduced costs. All these other benefits add up to reduced costs. 5S programs don’t require much investment and often pay for themselves in very short order. – Better lighting: Keeping everything clean, shiny, and uncluttered generally makes shops brighter. Believe it or not the EPA is a big proponent of 5S for exactly this reason. – Improved production agility and flexibility: A high functioning 5S shop has added many practices and tools that can be harnessed to improve production agility and flexibility. If nothing else, 5S will dramatically reduce wasted time spent searching for what’s needed to set up the next job. – Improved morale: Who wouldn’t prefer to work in a clean well-organized environment? – Better sales: Presenting a better image to customers and suppliers is going to lead inevitably to a better chance of closing the sale. It should be clear from this list that there’s considerable benefit in implementing a 5S program for your organization.